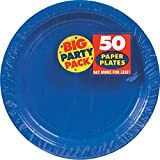 AzBaja.com, Home of the VW Baja Bug -:- BizStore » Toys » Amscan Bright Royal Blue Paper Plate Big Party Pack, 50 Ct.
BizStore » Toys » Amscan Bright Royal Blue Paper Plate Big Party Pack, 50 Ct.
Amscan Bright Royal Blue Paper Plate Big Party Pack, 50 Ct.
Use these Royal Blue paper plates to make any dinner, party, or midnight snack into a fun and easy meal. Each pack of 50 is bounding with bright, exciting color and the 7 in. diameter is perfect for lunch or dessert. These plates make hosting feel like a piece of cake. • Amscan Bright Royal Blue Beverage Napkins Big Party Pack, 125 Ct.
• Amscan Bright Royal Blue 2-Ply Paper Dinner Napkin Big Party Pack, 50 Ct.
• Amscan Bright Royal Blue Paper Plate Big Party Pack, 50 Ct.
• Amscan Bright Royal Blue Luncheon Napkins Big Party Pack, 125 Ct.
• Apple Red Dinner Paper Plates Big Party Pack, 50 Ct.
• Apple Red Big Party Pack Paper Plates, 7", 50 Ct.